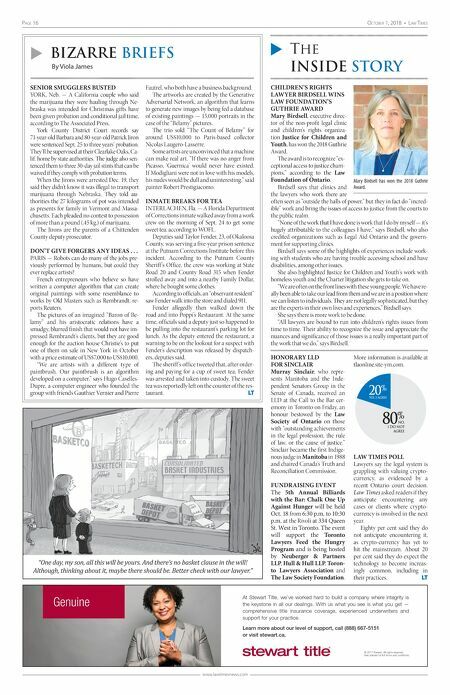 Page 16 OctOber 1, 2018 • Law times www.lawtimesnews.com u Bizarre Briefs By Viola James u The InsIde story "One day, my son, all this will be yours. And there's no basket clause in the will! Although, thinking about it, maybe there should be. Better check with our lawyer." SENIOR SMUGGLERS BUSTED YORK, Neb. — A California couple who said the marijuana they were hauling through Ne- braska was intended for Christmas gifts have been given probation and conditional jail time, according to The Associated Press. York County District Court records say 71-year-old Barbara and 80-year-old Patrick Jiron were sentenced Sept. 25 to three years' probation. They'll be supervised at their Clearlake Oaks, Ca- lif. home by state authorities. The judge also sen- tenced them to three 30-day jail stints that can be waived if they comply with probation terms. When the Jirons were arrested Dec. 19, they said they didn't know it was illegal to transport marijuana through Nebraska. They told au- thorities the 27 kilograms of pot was intended as presents for family in Vermont and Massa- chusetts. Each pleaded no contest to possession of more than a pound (.45 kg.) of marijuana. The Jirons are the parents of a Chittenden County deputy prosecutor. DON'T GIVE FORGERS ANY IDEAS . . . PARIS — Robots can do many of the jobs pre- viously performed by humans, but could they ever replace artists? French entrepreneurs who believe so have written a computer algorithm that can create original paintings with some resemblance to works by Old Masters such as Rembrandt, re- ports Reuters. The pictures of an imagined "Baron of Be- lamy" and his aristocratic relations have a smudgy, blurred finish that would not have im- pressed Rembrandt's clients, but they are good enough for the auction house Christie's to put one of them on sale in New York in October with a price estimate of US$7,000 to US$10,000. "We are artists with a different type of paintbrush. Our paintbrush is an algorithm developed on a computer," says Hugo Caselles- Dupre, a computer engineer who founded the group with friends Gauthier Vernier and Pierre Fautrel, who both have a business background. The artworks are created by the Generative Adversarial Network, an algorithm that learns to generate new images by being fed a database of existing paintings — 15,000 portraits in the case of the "Belamy" pictures. The trio sold "The Count of Belamy" for around US$10,000 to Paris-based collector Nicolas Laugero-Lasserre. Some artists are unconvinced that a machine can make real art. "If there was no anger from Picasso, 'Guernica' would never have existed. If Modigliani were not in love with his models, his nudes would be dull and uninteresting," said painter Robert Prestigiacomo. INMATE BREAKS FOR TEA INTERLACHEN, Fla. — A Florida Department of Corrections inmate walked away from a work crew on the morning of Sept. 24 to get some sweet tea, according to WOFL. Deputies said Taylor Fender, 23, of Okaloosa County, was serving a five-year prison sentence at the Putnam Corrections Institute before this incident. According to the Putnam County Sheriff 's Office, the crew was working at State Road 20 and County Road 315 when Fender strolled away and into a nearby Family Dollar, where he bought some clothes. According to officials, an "observant resident" saw Fender walk into the store and dialed 911. Fender allegedly then walked down the road and into Poppi's Restaurant. At the same time, officials said a deputy just so happened to be pulling into the restaurant's parking lot for lunch. As the deputy entered the restaurant, a warning to be on the lookout for a suspect with Fender's description was released by dispatch- ers, deputies said. The sheriff 's office tweeted that, after order- ing and paying for a cup of sweet tea, Fender was arrested and taken into custody. The sweet tea was reportedly left on the counter of the res- taurant. LT CHILDREN'S RIGHTS LAWYER BIRDSELL WINS LAW FOUNDATION'S GUTHRIE AWARD Mary Birdsell, executive direc- tor of the non-profit legal clinic and children's rights organiza- tion Justice for Children and Youth, has won the 2018 Guthrie Award. The award is to recognize "ex- ceptional access to justice cham- pions," according to the Law Foundation of Ontario. Birdsell says that clinics and the lawyers who work there are often seen as "outside the halls of power," but they in fact do "incred- ible" work and bring the issues of access to justice from the courts to the public realm. "None of the work that I have done is work that I do by myself — it's hugely attributable to the colleagues I have," says Birdsell, who also credited organizations such as Legal Aid Ontario and the govern- ment for supporting clinics. Birdsell says some of the highlights of experiences include work- ing with students who are having trouble accessing school and have disabilities, among other issues. She also highlighted Justice for Children and Youth's work with homeless youth and the Charter litigation she gets to take on. "We are often on the front lines with these young people. We have re- ally been able to take our lead from them and we are in a position where we can listen to individuals. They are not legally sophisticated, but they are the experts in their own lives and experiences," Birdsell says. She says there is more work to be done. "All lawyers are bound to run into children's rights issues from time to time. Their ability to recognize the issue and appreciate the nuances and significance of those issues is a really important part of the work that we do," says Birdsell. HONORARY LLD FOR SINCLAIR Murray Sinclair, who repre- sents Manitoba and the Inde- pendent Senators Group in the Senate of Canada, received an LLD at the Call to the Bar cer- emony in Toronto on Friday, an honour bestowed by the Law Society of Ontario on those with "outstanding achievements in the legal profession, the rule of law, or the cause of justice." Sinclair became the first Indige- nous judge in Manitoba in 1988 and chaired Canada's Truth and Reconciliation Commission. FUNDRAISING EVENT The 5th Annual Billiards with the Bar: Chalk One Up Against Hunger will be held Oct. 18 from 6:30 p.m. to 10:30 p.m. at the Rivoli at 334 Queen St. West in Toronto. The event will support the Toronto Lawyers Feed the Hungry Program and is being hosted by Neuberger & Partners LLP, Hull & Hull LLP, Toron- to Lawyers Association and The Law Society Foundation. More information is available at tlaonline.site-ym.com. 80 % NO, I DO NOT AGREE YES, I AGREE 20 % LAW TIMES POLL Lawyers say the legal system is grappling with valuing crypto- currency, as evidenced by a recent Ontario court decision. Law Times asked readers if they anticipate encountering any cases or clients where crypto- currency is involved in the next year. Eighty per cent said they do not anticipate encountering it, as crypto-currency has yet to hit the mainstream. About 20 per cent said they do expect the technology to become increas- ingly common, including in their practices. LT Genuine © 2017 Stewart. All rights reserved. See policies for full terms and conditions. At Stewart Title, we've worked hard to build a company where integrity is the keystone in all our dealings. With us what you see is what you get — comprehensive title insurance coverage, experienced underwriters and support for your practice. Learn more about our level of support, call (888) 667-5151 or visit stewart.ca. Untitled-3 1 2018-07-04 10:44 AM Mary Birdsell has won the 2018 Guthrie Award.